False ecumenism in Great Britain and in America has weakened the faith of many Catholics, who want to pretend that those who have heard of the teachings of the Catholic Church and yet have walked away will be saved. Christ, Who Is the Second Person in the Blessed Trinity, Who IS Divine, gave us the above words. Without Holy Communion, there is no life in a person. I did not make this up. The Church did not make this up. Those who have heard this and read this passage and still walk away do not have life within them. Why is it that Catholics do not understand this passage as the hard truth? Evangelization has nothing to do with numbers or even renewing the Church. Evangelization has to do with saving persons from hell. Evangelize daily. Take what Christ has said seriously. Be grateful for the grace given to you as a Catholic. Do you have family members who no longer go to Mass? Remind them of this passage. Do you have friends or fellow workers who are good Protestants, but cannot bring themselves to come over to Rome, read this passage. 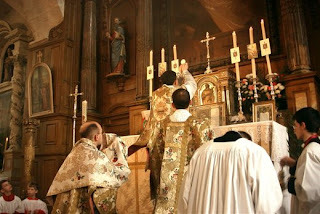 Without the Mass and Holy Communion, especially for a fallen away Catholic, there is no life in the soul. The soul is dead. If I lived in Scotland, I would be voting for separation....small is beautiful. ...I am an INTJ, it is easier for me, than those more emotional or extrovert, to be objective. I am wired to be objective. But, I have learned some good lessons to share with those who are struggling with being hurt all the time, being defensive, and not growing in the way of perfection. The Dark Night of the Senses purges the physical sins. The Dark Night of the Spirit purges spiritual sins. Here are some hints if you are having trouble in the Dark Night with the purification of the spirit. 1) Learn to forgive, quickly and always. This may take practice. 2) Never, never go over the past and hold grudges. Too many Catholics keep going back to nurse hurts. Move on. 3) Create boundaries in your spirit if you have never formed these as a child. Boundaries are a sign of healthy self-love. If you let others manipulate you, you will never become holy. 4) Pray for those who hate you. 5) Surround yourself with good, strong, "grounded" Catholics. I refuse to hang around whiners who cause sin in others by constant negativity and complaining. This fact alone is another reason why we all need strong Catholic communities. Real Catholics are realistic but positive about their end goal. 6) Cooperate with God on matters of humility. I could have grown so much faster but was not generous with God and delayed progress in the Dark Night by fighting pain and suffering. Once one gives in to God and is resigned, things happen quickly. 7) Realize that the desires of your heart are from God from all time. Providence put those desires into your heart IF they are for good and the building of the Kingdom of God. Of course, this idea does not apply to mere material desires, which should have been dealt with in the Dark Night of the Senses. 9) Embrace the Dark Night with joy, as it means that God is calling you specifically. 10) You have a purpose in the Kingdom of God. In the Dark Night of the Spirit, this should become more obvious, as to your call. Similarly, the theory of man-caused, catastrophic, global warming is embraced not because of any “science,” (that sham is for the “useful idiots,”), but because it is a justification for a government takeover of the energy industry, with massive increases in regulation, taxes and government spending. The United Nations loves it because it inspires fantasies of the UN growing up to be a world government, with real government powers of global taxation, spending and regulation, all “to save the planet.” Scientists who go along with the cause are rewarded not only with praise for their worthy social conscience, but also with altogether billions in hard, cold cash (government and environmental grants), for their cooperation in helping to play the “useful idiots.” Moreover, many academic scientists are “progressives” themselves, and so favor sharp increases in government spending, taxes and regulation, because they are certain they know how to run your life better than you do. For example, the authors report, “The IPCC concedes for the first time that a 15 year long period of no significant warming occurred since 1998 despite a 7% rise in carbon dioxide (CO2).” The authors explain, “The statement represents a significant revision in the IPCC thinking, because their concern about dangerous warming rests upon the assumption that temperature increases will proceed in parallel fashion with CO2 increases.” Climate Change Reconsidered II documents that the same official temperature records used by the IPCC going back over 100 years, and proxy temperature records going back deep into the geologic time scale, show that temperatures have not changed in parallel with CO2 levels. Central to the IPCC’s argument for anthropogenic, catastrophic global warming is its dozens of global climate models and their projections of growing global temperatures over time. But the SPM now concedes that these models have failed to project the now admitted lack of warming over the last 15 years. The Pope talked about Catholic identity. This is key to the survival of the Church in Europe and in America. The Holy Father stressed the Incarnation, that Christ came into history and created community. Just in the past week, I wrote about the need for memory-in the face of memoricide. Read those posts. Now, today, the Pope calls us memorioso, people of living history. Christian without a church is something purely idealistic, it is not real". "But you cannot understand a Christian alone, just like you cannot understand Jesus Christ alone. Jesus Christ did not fall from the sky like a superhero who comes to save us. No. Jesus Christ has a history. And we can say, and it is true, that God has a history because He wanted to walk with us. And you cannot understand Jesus Christ without His history. So a Christian without history, without a Christian nation, a Christian without the Church is incomprehensible. It is a thing of the laboratory, an artificial thing, a thing that cannot give life...walking with a promise. This dimension, it is important that we always remember this dimension of history"
..."A Christian is a living memory of the history of his people, he is a living memory of his people’s journey, he is the living memory of his Church. Memory ... memory of all of the past ... Then, where is this people going? Towards the ultimate promise. It is a people walking towards fullness; a chosen people which has a promise for the future and walks toward this promise, towards the fulfillment of this promise. And for this, a Christian in the Church is a man, a woman with hope: hope in the promise. It is not expectation: no, no! That’s something else: It is hope. Right, on we go!... (to) that which does not disappoint". I love twitter. I have made good Catholic twitter friends. I have learned tons quickly about the Catholic world. But, in the past week, four of my male twitter friends have RTed inappropriate photos. One friend I talked to admitted he was wrong and apologized, but I have decided to block the others. What gives? Do men not know that photos of popular singers with posters of almost naked women are not kosher for Catholics? Do men not know that photos of raunchy gay men who may be cheerleaders are not worthy topics for RTs? Are Catholic men so desensitized to sexual imagery that they can no longer discern what is appropriate? That Satan hates mankind is obvious. He is miserable and will be for all eternity, so he wants as many of God's human creatures to be as miserable as he is. He also hates God Who Is All Goodness. And, he hates Mary, the Perfect Mother of God, the Virgo Potens, who has crushed his head with her humility, purity and obedience, all things he lost in his instance of rebellion. Because Satan hates Mary, the Daughter of God, the Bride of Christ and Mother of God, he hates all daughters, brides, and mothers. One of the reasons why there is so much contraception and abortion aimed at getting rid of girls is because Satan hates women. Catholic women mold themselves into mini-Marys, trying to imitate the virtues of Mary as much as they possibly can, with the grace and virtues God has given them. But, Satan wants to hold back, and destroy those virtues in women, causing rebellion and the masculinizing of women across the world. Just as men have been feminized through the gay rights movements, so to have women become more masculine. Mary is our model for complete femininity. She is our model for all feminine virtues. Satan has taken away from men that sense that women and children need protection by creating narcissists and peter pans. I have written much on this topic. Mary, especially as Virgo Potens, is our stronghold against the attacks of Satan on our womanhood. Pray the rosary daily. Honor her. And, Satan will flee from your world. Mary instructs us to be women of the Church Militant as well. This illustration bears evident martial features. Mary's picture is set against a shield, which is surrounded with a panoply of weapons, from bow and arrow to flags and cannons. Mary holds in her hand a commander's staff; however, the motto around her head refers to Christ. It says, "I can do everything in Him." Right and left of Mary's image we read this inscription, "He made powerful things with his arm." On the lower half of this illustration we find the representations of two powerful typological feminine figures of Mary in the Old Testament. To the left we have Jael, who killed Sisera, the commander of the Canaanites, hammering and crushing his head with peg and mallet (Judges 5:26). The woman to the right is Judith decapitating Holofernes (Judith 11:17). "In your hand are virtue and power" ( 1 Paral 29). Mary is sometimes called the New Eve. But, a thought came to me today in my contemplation on sins of envy and pride. Some theologians claim that Satan fell when he was shown the future and the fact of the Incarnation. Some say he refused to serve God in the Person of Jesus Christ, True God and True Man. But, what if Satan saw the honor given to the most perfect of creatures made by God, the Immaculate Conception? What if Satan refused to honor the Theotokos, or even accept his inferiority to her as the brightest angel in the heavens? What if he was so envious of Our Lady's perfection that he plotted to tempt Eve in retaliation for the most beautiful creature on earth, who he would have to serve, the New Eve, Mary? What if Satan's hatred and temptation of Eve came from his envy and pride? It is odd that in my short life, I have met priests who do not love Mary. One actually told me "The Church no longer emphasizes Mary." How interesting that years later I found out that these priests who hated Mary were acting homosexuals. The grave sins of the universe, especially pride and envy, prevent a man from loving Mary. Satan does not nor ever did love Mary. Is is possible that he cried out "I will not serve" because he would have served The Woman?